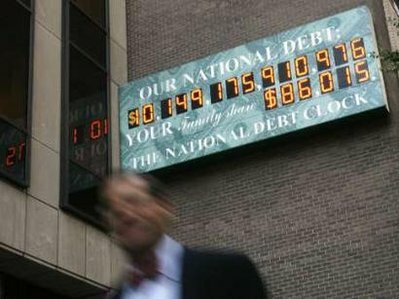 According to the Associated Press, the national debt clock maintained by the Durst Organization on a billboard near Times Square in New York City has run out of digits now that the national debt has for the first time exceeded $10 trillion. That’s more than $86,000 for each American family. Whom do we owe it to? Not to ourselves as the “powers that be” would like us to believe, but to all those who own dollars and U.S. Government bonds, notes, and bills. Yes, some are held by pension funds, but vast amounts are held by foreign central banks, especially China, Japan, and the OPEC countries. An item that appeared in Yahoo News, dated Wed Oct 8, reports that “The late Manhattan real estate developer Seymour Durst put the sign up in 1989 to call attention to what was then a $2.7 trillion debt.” Two more digits will shortly be added to enable the debt to be tracked up to one quarter quadrillion dollars. One must wonder what the dollar will be worth by then. This entry was posted in Geo-politics, The Political Money System and tagged clock, debt, dollar. Bookmark the permalink. Maybe it’s because I am getting a little older but this whole national debt thing has got me very concerned. At the rate it is going we will either be taxed to death or owned by a foreign country. Why doesn’t the Congress see this and start to do something about it? 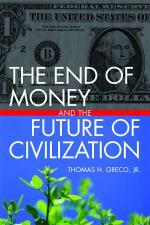 The debt money system, based as it is on compound interest, requires the continual growth of debt. Congress is powerless to do anything about it. They serve the bankers. This is an unbelieveable blog! I really wish that someday I could have a blog that is as well done as this..
Sen. Lowell Barron and other members of the Senate Democratic Caucus said Wednesday they will make the proposed constitutional amendment a priority for the legislative session beginning Jan. 12.